Your cycling experts and guides will share with you their knowledge, enthusiasm, and love of the region during your stay. They help you create a unique and memorable cycling adventure based around the greatest race in the world. RCT would simply not exist without the unfaltering dedication of our "Big Boss". His attention to detail and contagious enthusiasm for alpine cycling and the Tour de France make for a memorable trip, year after year. Fintan's athletic career began in his early years as a runner and later as a Triathlete. Intrigued by endurance sports Fintan completed his first marathon at age 15 and continued on to Half Ironman and Ironman racing. Fintan is an alumnus of La Marmotte Cyclosportif, a Mountain bike Instructor, has trained and been tested for aerobic endurance at the prestigious Cooper Institute in Dallas, Texas where he gained his Fitness Specialist certifications. His love of cycling and the Tour de France was one of the catalysts for the creation of Reilly Cycling Tours and our Boss has guided hundreds of cyclists through the Alps for the past 15 years. He relentlessly searches for new rides, new challenges and ways to make our Tours that much more unique. It is that passion that comes through when you meet Fintan. He simply loves this stuff and he will tell you, "You can do more than you think you can! " - especially when he's around! Co-founder and lead guide David Weiss, “Phurba”, is one of the strongest alpine cyclists you will meet, and our peace of mind on the road. As long as he is around we know you’ll be okay. Dave's interest in cycling began very young when as a teenager he opened his own cycling shop. The 'Recycle Shop' was born in Dave's basement and along with his brother Mike and father Daniel the three Weiss men fixed, re-tooled and breathed life back into the local communities rides. These skills have not left and Phurba now builds just about everything including some dreamy wheelsets! Dave has competed and raced in the elite division at such prestigious races as the Mt Washington Hill Climb, La Marmotte Cyclosportif, and the Hillier Than Thou endurance race. He is a highly talented athlete who has competed in multiple marathons, including New York City, Philadelphia, and Boston. Dave trains everywhere there are mountains and is most at home in the most difficult terrain. Training with Phurba has long been described as a sufferfest and is not recommended for most! His knowledge of the mountain passes and his experience riding at the Tour make him a huge asset to our team. His expertise on bike fit and set-up are priceless, and we call him “Phurba” after the famous Nepalese Sherpa who carries climbers up to the heights of Everest. If you need to be carried - Phurba has you covered ! ​Leonie is our multi-lingual, multi-talented trip coordinator, and her knowledge of the Alps and surrounding area is as detailed as any in the field. Guests are always amazed at her detailed descriptions of the climbs, and her flawless management of logistics around the Tour de France. On the bike, Leonie is a fearsome climber and a natural talent on the downhills. She is an alumnus of the gruelling La Marmotte cyclosportive and with the ability to speak multiple languages you never know who you'll meet when she is around! Leonie's true passion is route-finding, and some of our “secret” gems that we take our guests on are the result of her forays far and wide in the Alps. She is always on the hunt for that perfect mountain road! After completing basic Infantry training, she spent five years in the military reserves and has always enjoyed pushing her limits, physically and mentally. Leonie has summited Mt Kilimanjaro and can be found high-altitude hiking in the Peruvian Andes all while brushing up on her Spanish. Above all, Leonie is a musician – she makes her living as a professional flutist. She is a full-time, tenured member of the prestigious Toronto Symphony Orchestra and has received numerous awards for her performances around the world. Bribe her with some chocolate and she might just play for you at dinner! Mike can do it all! Mike is your best friend, your family, your training partner, and maybe even the best therapy you could ask for! 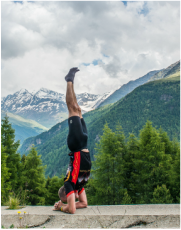 A naturally gifted cyclist, Mike is supremely strong and has an incredible ability to race up and down the Alps all day long in service of our clients. Mike can ride as fast or as slowly as you want, all the while keeping your mind active with his unique and witty conversation. He is an elite-level rider and has competed in the infamous Mt Washington Hill Climb and several other events on the East Coast. He trains through the winter in the Catskill Mountains of New York and is always the guy with the big smile and the frozen water bottles! Mike epitomizes the relaxed atmosphere that exists in Villard-Reculas, and can be found most any morning with a bowl of oatmeal, a kiwi fruit, and a good cup of strong coffee in hand. A talented bike mechanic and superb sag driver (barefoot, of course! ), Mike is anywhere and everywhere and is a key player in our ride itinerary each year. He is one of those genetically gifted riders that make it all look easy, and we guarantee that you’ll enjoy every minute of a climb with him next to you. We call him ‘The Bridge’ because he’s the link between the staff and the guests. Mike enjoys himself so much that we're never sure whether he's on the trip as a guest or staff…...we love it that way…..and you will too! ​A personal trainer and Police Dept Fitness Instructor for over 20 years, Robin has made a living and a life based around physical fitness. 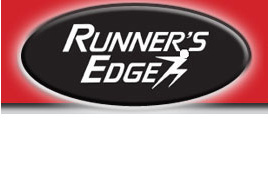 Robin began running marathons in the mid 1980s and earned credibility quickly with 3hr performances in New York City. He has been a certified and practicing Yoga Instructor for the past 12 years and teaches yoga classes to his devoted followers, weekly on Long Island, NY. A true all-round talent, Robin has not only competed, but even made it to the podium, at the prestigious Police & Fire Olympics as a champion wrestler. 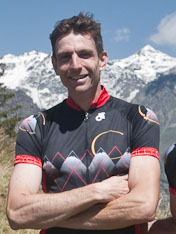 Robin’s certification as a Police Mountain Bike Instructor sparked his interest in cycling, and he has been an alpine cycling guide for the past several years. He most recently rode the Marmotte Cyclosportif, not only finishing the race, but assisting/pushing RCT clients throughout the 110-mile alpine endurance event. Robin teaches an Alpine Yoga class each morning for our cyclists. His soft nature, contagiously upbeat attitude, and ‘can do’ approach is always welcome. There is nothing Robin can't do .We call him ‘Tigger’ because he’s always smiling, always happy, and just loves to ride! ​A ride in the SAG van with Zoe never disappoints! Our SAG boss, Zoe, aka 'Sparkle Bunny' is someone you need to meet. Multi-lingual in a way you would least expect, she has an uncanny way of making you realize this IS a vacation! Zoe will keep you on your toes all week, between her Ivy league education, stunning looks, skillfull driving and effervescent personality, the SAG van is a popular place to hang out and recover. Laureenie is always smiling. It's her trademark!! A former fitness Instructor and Personal Trainer Laurene brings her own unique style to Reilly Cycling. She's an accomplished Athlete with a background in half marathon racing. She is a wealth of knowledge in fitness training from Crossfit & Orange Theory style training to Yoga. Couple all that with the sweetest most caring person and you have Laurene. She simply has a way of making sure every detail is catered to on our trips and she makes it all look effortless. She could easily stand in for the chef as her culinary skills are amazing! A Food & Wine expert Laurene is perfectly at home on the bike, running trails or in the kitchen! There is very little our little over-achiever can't do!! She loves a challenge especially Words with Friends or Jeopardy! ​Teri is a former professional triathlete who trained out of Tucson, Arizona - home of the famous Mount Lemmon. She has had impressive results in bike races such as the Tucson Bicycle Classic, and the Mount Lemmon and Kitt Peak annual climbs, but triathlons, and specifically Ironman triathlons, are where her heart lies. On top of her triathlon training, Teri's experience has been as an exercise physiologist and nutrition counsellor at Tucson's prestigious Canyon Ranch Spa. She's the one who will stay by your side for eight hours straight on the bike and just keep telling you, "You're doing AWESOME!". ​Lisa began as a distance runner at age 13 and continued to grow as an athlete until she entered the world of triathlon 10 years ago. Her solid running background served her well, and for the past six years Lisa has been a professional triathlete based in Tucson, Arizona. She has award-winning podium performances all over the world in both cycling and Ironman. Yes - she's really that good! Despite her running background, it is on the bike were Lisa truly excels. She is a world-class cyclist, and her climbing abilities on the bike leave even the most hardened riders grasping to hold her wheel. If you want to be tested, hang with Lisa on a climb! Just make sure she knows you want to go fast or she'll be quite happy chatting and riding along next to you. She is super sweet, a true gem, and a wonderful person to spend your week with. We call her Reese's Pieces - it's the perfect name for her!